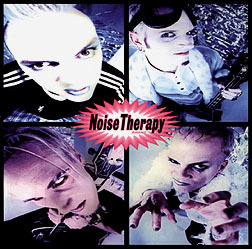 CD Review: Noise Therapy, "The Dr. Johnny Fever Remixes"
As Butthead would say, "Uuuuuuumm, is this some kinda joke?" I hope that's what it's meant as; but, whoever signs the cheques for Noise Therapy Corp. better keep a closer eye on the boys: this is a pretty damned expensive joke. What we have here is a five-song EP CD: three essentially identical "re-mixes" of the disco chestnut "That's the Way (I Like It)" and a lame song called "What's Wrong with the World," both done disco/dance/techno-like and both, according to the liner notes, written by Noise Therapy (hmmm). Tacked on the end is "Dunce," almost certainly the best single to come out of Vancouver in '96 (and the same version released in June on the Turtle compilation). The re-mixes aren't bad, per se, but they're throw-aways, something fun and goofy for a late-night studio session, good for B-sides, maybe a cassette. So why put them out on CD ($$$) as evidence of all the band has been up to for the last year?!? Sorry, guys. Give us "Dunce" (can I emphasize enough how good that song is?) and three more songs half as good and you would be declared deities. Give us this EP and you make us wonder if you've still got it in you. Oh yeah, if anyone in the band plans to stalk me, call ahead for directions, first.